A new generation of fake driver’s licenses has infiltrated the Washington, D.C. region, many of them sophisticated enough to fool law enforcement and scanning devices, according to a review by the News4 I-Team. Montgomery County Department of Liquor Control officials reported an influx of thousands of phony licenses in recent months, including a series of fakes that successfully tricked the driver’s license readers utilized by county police officers during traffic stops. An overwhelming number of the licenses were confiscated from teenagers, who’d used the licenses to purchase alcohol at restaurants or retail stores. Law enforcement officials suspect the latest wave of IDs was generated in China. The driver’s licenses are manufactured there, officials said, then sold online to American teenagers. Police said some of the sites, including vendors which were recently scrutinized by Congress, sell licenses for approximately $150. Customers send credit card information or cash overseas to the site operators and later receive the phony identification in the mail. Lee Williams, an investigator for Montgomery County, said the ID manufacturers have meticulous attention to detail, and include some of the microscopic details featured in legitimate state driver’s licenses, including watermarks and fine print. The News4 I-Team, using a scanning device popular with bar bouncers and taverns, tested many of the seized licenses held by police in Maryland. Approximately 100 of those tested successfully deceived the machine, reading and displaying on the scanner as if authentic. 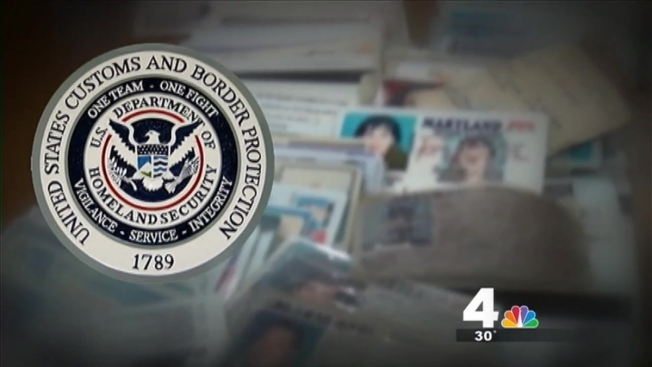 The risk of phony IDs impacts the Mid-Atlantic region of the United States, according to records obtained by the News4 I-Team. A database of seizures by U.S. Customs and Border Protection shows a nearly 130 percent increase in seizures of altered or counterfeit travel documents in Virginia, Maryland, D.C., southern New Jersey and Delaware. Those documents include altered passports.